Cycling is traditionally the second portion of a race. It is the longest distance of the race, and it requires the most equipment of all the sports. We offer sample 8-week sprint-distance triathlon plans for bronze-level, silver-level, and gold-level athletes. 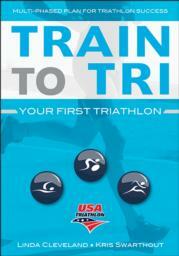 The training plans include the swim, bike, run, and strength-training workouts as well as any rest or recovery days. One of the keys to your success in training for and completing your first triathlon, besides putting in all the training time, is your support group. Your journey will be much easier if you find people who want to help you complete your first triathlon by offering moral support, providing childcare support, motivating you, being a workout buddy, or just cheering you along the way. The leading experts from the triathlon’s national governing body provide training plans, strategies, and preparation advice for first-time competitors. Ideal for athletes gearing up for a sprint or standard triathlon, this original program can be tailored to any phase of the multisport event. Included are assessments, exercises, and schedules to ensure the first race is a successful one.